Chris offers another take on Bethesda's latest. Strap in folks, it's a big one! I have loved Fallout for over 20 years. I own every Fallout game that has released on PC and have multiple copies of each including Collectors Editions, limited editions, and special collected edition reissues. I even own the original big box releases from the late 90’s. I adore the original games released by Interplay and have thoroughly enjoyed all three single-player titles published by Bethesda. I own figures, statues, toys, clothing, and various pieces of Fallout bric-a-brac collected over the last couple of decades. I am a Fallout fan and I despise Fallout 76. I have never used the word despise in a review. I don’t think I have ever used that word to describe a video game in my life. That being said the level of disdain I have for this title is well earned. It is the culmination of many mistakes, failures, and an apparent lack of understanding of Fallout and its fans. There are no human NPCs, in fact there are basically no interactive NPCs at all aside from vendors and a few robotic characters. My issues with this game are legion, so I think it best to start with the things that may be less of an issue for the majority of people coming into 76. Of all the gripes I have these are the ones that are very specific to the Fallout nerd I am, and I admit that they are likely not going to detract from the experience for most people. But I think they represent a design ethic or way of thinking that has tainted all aspects of the game. Fallout 76’s Appalachia is canonically problematic both in terms of the time it is set and in the way it presented. Not only that, it does not make sense in terms of its own internal logic. Set 25 years after the bombs drop and 60 years before Fallout 1, Appalachia is at least conceptually an exciting location to explore. Containing more distinct biomes than any previous Fallout game, it offers up more variety than we have ever seen in any post-apocalyptic video game. And therein lies the rub. Every mutated nasty you’d expect from a modern Fallout game plus many more besides can be found here. But that raises the question as to how they are there. The game establishes that this region was not directly affected by the war and the amount of radiation as a result was much lower allowing many parts to remain relatively untouched. Why then are we seeing grotesquely mutated creatures everywhere? Why are there more mutations and more extreme mutations here than we’ve seen anywhere else in the Fallout universe? It’s a minor niggle in the scheme of things but the inconsistency annoys me, as does the apparent lack of care in getting the basics right when it comes to establishing the game world. More problematic though are the returning elements. Super Mutants should not exist here, and the reason provided for their appearance is lazy, ill-conceived, and frankly insulting. As it is plot I will not divulge it here but considering back-story around their creation to see them so ham-fistedly inserted into 76 for the sake of there being Super Mutants in Appalachia is at best disappointing. This was not the worst of it, The Brotherhood of Steel or at least the remnants of them can be found here too. The pseudo-religious, extremely exclusionary power-armour wielding faction were defined by their founder and the manner in which they respond to the outside world after the apocalyptic fall of civilisation. Once again, the in-world rationale is jaw-droppingly shallow and just as with the Super Mutants seems to be more about including these icons rather than presenting a canonically consistent universe. It also makes selling BOS skins a little easier in the in-game store. I am the first to admit that these are aspects of the game that a lot of people can either overlook or just don’t care about in the first place but as I said previously, they demonstrate a mindset that has affected the entire game. The idea of including something because it is easy, convenient, or just for the sake of it rather than ensuring it is valuable, logical, or entertaining. This is perhaps most easily demonstrated in the world itself. Considering this game is set almost 200 hundred years before Fallout 4 (2102 vs 2287) the number of reused assets is alarming. From buildings to vehicles and various in-world items 2102 Appalachia seems to have degraded rapidly despite not being hit directly like Massachusetts was. 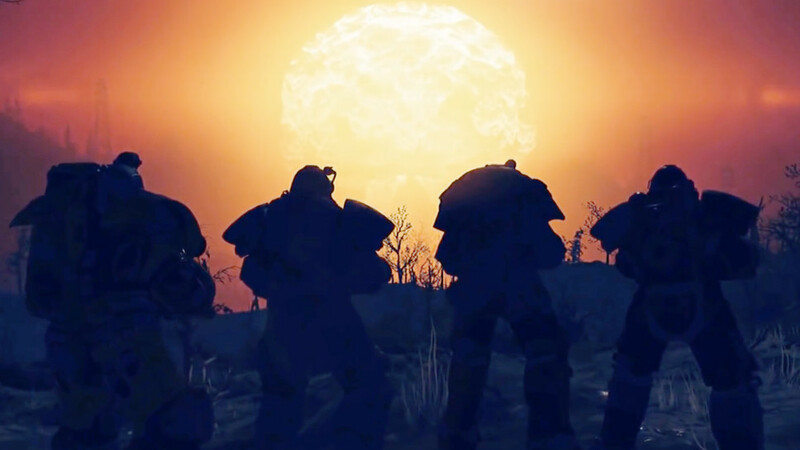 The problem here is three-fold – it’s inconsistent with the previously established world, demonstrates a lack of care in the creation of some of Fallout 76’s environments, and constantly reminds the player of Fallout 4 which in many ways hurts 76 as it attempts to be a very different experience from its predecessors. My player character stayed on fire like this for a whole session. Not a single element here is executed well. In fact almost all of the elements actively detract from the others. Fallout 76 is unlike any previous Fallout title. Rather than a sprawling story-driven open-world single-player RPG, 76 is designed around the multi-player experience. Bethesda wants you to play with or against other people. There are no human NPCs, in fact there are basically no interactive NPCs at all aside from vendors and a few robotic characters. It is a bold choice to remove NPCs and sadly it has not paid off here. All that is left of the denizens of Appalachia are holotapes, logs, and various notes scattered throughout the world. While these usually do a fine job of building out a game world they cannot provide the backbone for one. What we’re left with is a passive narrative experience where you encounter everything after the events have already concluded. This single choice has stripped out some the most compelling parts of any Fallout game, people and personality. Gone is the quirky humour, the twisted individuals who have scraped by in the irradiated wastes, gone too are the sentient creatures who have adapted to, or been changed by the background radiation. While there are a few characters in the game you can directly interact with, for the most part you’re just passively receiving instructions for the next in a long line of shallow fetch quests. I could go on for pages about all of the ways Fallout 76 fails to deliver a proper Fallout or RPG experience, but this is not a typical Fallout game nor is it an RPG so those criticisms while relevant to a degree are likely not at all important to anyone coming in wanting an online Fallout themed survival experience. So let’s wipe the slate clean and look at what Fallout 76 is rather than what I wanted or hoped it would be. Fallout 76 is a survival game. It takes elements of Rust, The Long Dark, The Forest, and Ark, or any number of established titles in the genre and applies a veneer of Fallout to them both in terms of aesthetic and core game elements. This online-only experience combines co-op questing, and exploration with public events and character customisation, crafting, and base building as well as PvP for those feeling antagonistic towards their fellow players. Not a single element here is executed well. In fact almost all of the elements actively detract from the others. Infuriatingly the only enjoyable part of the game also causes the most issues. Co-opping with friends or strangers can be fun. In fact I had a few moments where I was having an absolute blast playing in a group. Sadly these are fleeting, and I quickly realised that the fun I was having was not due to the game, but because the people I was playing with were entertaining as hell. On the other hand it is essentially impossible to quest with a party because they will constantly talk over any voiced dialogue or because of the shared nature of a quest objectives they’ll just pop-up as others find them breaking the flow or introducing a whole slew of new quests you’ve not yet unlocked or discovered. What makes this all the more infuriating is the always-on voice-chat. With no push-to-talk I was getting a constant stream of noise poured over me from every member of my team, or anyone in the direct vicinity depending on the setting I was using. It is the worst of both worlds where the core game design is fighting against itself. PvP is not even worth exploring. As there are no dedicated PvE or PvP servers you can attack any other player, but unless they actively engage you in combat you’ll just be pinging them for minute amounts of damage. I literally had some guy shoot at me constantly as I was exploring an abandoned factory looking for junk so I could repair my busted weapons. I was not going to engage as he was a number of levels higher than me, so I had to endure his alarmingly persistent idiocy for a solid 5-10 minutes. Actual PvP combat is a joke, the clunky shooting and melee mechanics make for a shambolic experience as best. As I was playing a melee focused character, I could essentially annihilate any other player around my level or lower by getting in close and bashing their virtual brains in. Hardly compelling or rewarding as the only thing you can collect from their corpse is literal junk. So let’s talk about that junk. Expect to see the occasional enemy locked in a static pose. The world can be quite beautiful at times but it’s also devoid of interesting features or things to discover. The crafting and building systems from Fallout 4 have returned in all their busted glory only to become a bigger and more monotonous chore. Your gear will break, so it will need to be maintained or repaired. It can also be upgraded or built from scratch. All of these things require specific building materials from screws, to adhesive, to nuclear waste, fibre optic cabling, and about two dozen other components. These can be scrapped from items found in world. The constant need to repair and upgrade means you will be picking almost any random piece of garbage in the game in order to break it down at the next workstation you find. This actually the core game loop in Fallout 76 – pick up junk – scrap junk – store junk. And it is about as fun as it sounds, which is to say not at all. Once you’ve got your junk you can then attempt to fix your broken or damaged item, but will likely discover you are missing “construction item x” (usually screws, springs, or adhesive), and therefore need to perpetually repeat the junk collection just to ensure at least some of your gear is functional. My character is level 72 and even now I am required to scour the world for desk fans and tape to maintain amongst others my Super Sledge, Deathclaw Gauntlet, Black Diamond Ski Sword and even my Power Armor. I have spare weapons and armour as well because I know something will break I will not be able to immediately repair, because that apparently is where the fun in a survival game is to be found. Along with the requirement to find plans for certain upgrades and the fact you can’t use a damaged duplicate of an item to repair another the whole crafting system seems built around forcing the player to constantly pick up crap. When coupled with an inventory and stash that quickly fills up requiring you to dump items potentially useful later the whole system is nothing but an exercise in repeated frustration. Adding insult to injury is the return of perhaps Bethesda Games Studio’s biggest sin. Their persistent and long-established complete dismissal of the PC user experience. Aside from modding support Bethesda have ignored PC specific features since Oblivion released all the way back in 2006. There is no PC specific UI, HUD, or menu system. The PipBoy is still a pain to use, inventory management is nothing short of a nightmare, and don’t get me started on dealing with the pantry of food and drink you need to carry throughout your “adventure”. As well as a complete lack of consideration for mouse control in menus and most infuriatingly there was no thought given to utilising the platforms strengths in base construction. Construction sims have existed on the platform for decades, and yet PC players are still forced to use the restrictive control scheme from the console versions arbitrarily remapped to the keyboard. Building and placing items on PC should be the easiest thing in the world, but instead it’s the same awkward dance of changing contextual keys and a zoomed in first person view. Then there are the basics that have yet again been missed, patched in only after being called-out yet again for them, or planned to be patched in post-release, things like FOV, DOF, motion blur, ultra-wide support, lack of push-to-talk, and a locked frame rate to name but a few. The fact that PC players are not given equal consideration when it comes to the player experience is unforgivable, and after a decade and a half of the same complaints going ignored by Bethesda it’s hard not to feel like we’re being actively ignored. I have spent more time in Fallout 76 than any game this year. I decided that in order to be fair to Todd Howard, his team and the vision they have I needed to experience as much of it as I could. To that end I have fully explored every aspect of the game to the best of my ability. I have spent dozens of hours co-opping and grouping. I have battled dozens of other players for the right to claim to their detritus. I have nuked the world many times and explored the toxic cloud that remains and hunted the terrors that dwell within. I have spent the most time playing solo in order to explore the world and story. None of it was worth my time. The world can be quite beautiful at times but it’s also devoid of interesting features or things to discover. How could Bethesda the kings of emergent environmental story-telling screw up the one thing they truly excel at? It may be massive but it’s also empty. Every settlement is abandoned, or simply filled with various critters that need bashing, gutting, or skinned. What characterisation there is shallow and is unable to provide the much-needed human element to the tragedy that has befallen the world. The main story thread starts of interesting enough. The new humanoid enemies called the Scorched have the beginnings of an interesting origin and while you explore how they came to be and their relationship with Fallout 76’s big-bad The Scorchbeast it seemed that maybe Bethesda had added the first really interesting new element to the Fallout canon. Sadly this too soon devolves into a series or more and more convoluted fetch quests ultimately concluding with a payoff that is as underwhelming as every other aspect of the game had been until this point. 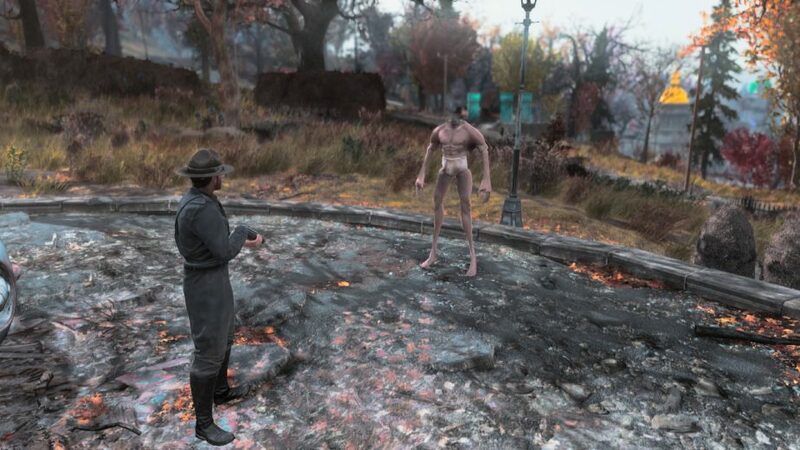 A bizarre power armor bug had more than a few players looking like this. Late game balance and content is also problematic as it relies on repeating the same actions over and over again. Nuke, explore, kill creeps, repeat. It quickly becomes a chore as there soon becomes no point in doing it. I have amazing gear so have no need to upgrade anything and I stopped gaining SPECIAL points at level 50. Unlocking or upgrading Perk Cards no longer serves much of a purpose as I am essentially locked into a build because many of the new cards cannot be used because I focused on upgrading my Strength and Intelligence and do not have enough points in other attributes to utilise the other Perks. Without any proper boss encounters or Event variety there simply is not enough to do once you’ve set the world on fire the first time. In a game that is supposed to keep you occupied for hundreds of hours I have completely exhausted all the options at little less than 80. In those dozens of hours I think I was genuinely entertained for maybe 2 of them and had I not committed myself to fully exploring the late game for the purpose of this review I would have given up well before hitting double digits. Then there are the bugs. The infamy of Bethesda’s buggy releases is as defining a feature as their generally exceptional world building. Those previous bugs are a mere annoyance compared to the veritable swarm of glitches, crashes, freezes, and technical problems that plague this game. 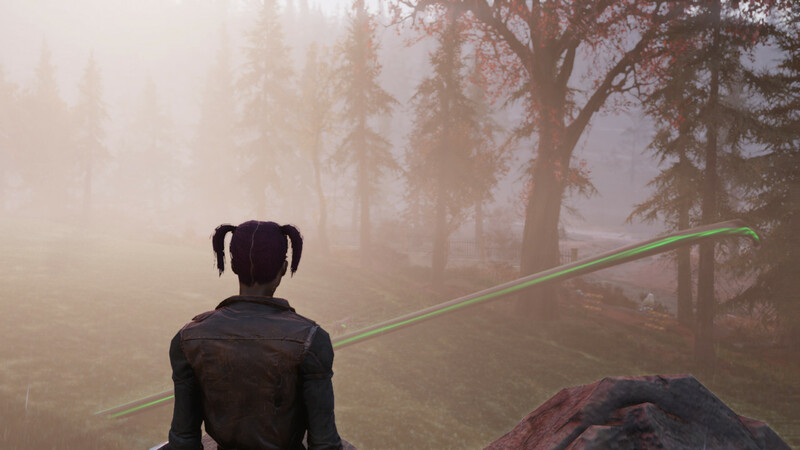 From broken quests, to server issues, to graphic and physics glitches I have experienced more problems in Fallout 76 than all of Bethesda Games Studio’s other releases combined. Some are minor like a quest not updating that simply required me to log out and in again to trigger. Others were far more aggravating like crashes that caused newly found or built items to vanish from my inventory, or caused me to have to repeat an already execrably tedious quest that oddly does not get any less so doing it a second time. The persistent performance issues and near constant graphical bugs made enjoying the simple act of exploration an exercise in frustration. I’ve experienced creatures spawning inside buildings I cannot access but needed to kill to complete a defence mission. 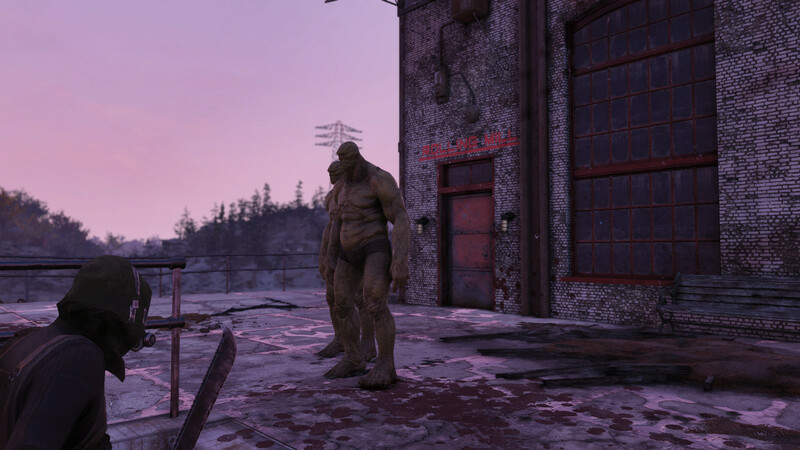 Countless cases of enemies not triggering and simply left standing in their default poses unmoving including an entire legion of Super Mutants just chilling in their stained Fallout 76s. I’ve even encountered multiple unplanned mutations both with players who have seemingly merged with their Power Armor in alarming ways, and various creatures that have elongated to become some weird serpentine variation that is almost impossible to hit. Then there was the time I was simply on fire for an entire session, which while helpful with spelunking was rather distracting to me and other players in my party. We’re about 3000 words deep now, and I’ve not yet talked about perhaps the biggest issue with Fallout 76. It is something that I feel is at least partially responsible for a multitude of the sins I have outlined above. The Creation Engine. From the muddy textures, to the primitive looking character models this archaic engine hurts the game at every turn. Draw distance is extremely low and generally the whole game feels and looks an entire generation out of date. This was actually the case back in 2015 when Fallout 4 was released and is far more obvious now, especially a few weeks after the gorgeous Red Dead Redemption 2 was released. Outside of its many and obvious technical short-comings the Creation Engine is ironically stifling creativity. We have a team working within the confines of an engine they have used in one way or another for almost 20 years. Despite a complete overhaul, multiple upgrades, and a name change, in many ways we are still seeing the limitations set by the GameBryo engine used all the way back for Morrowind. Todd Howard has touted the strengths of the engine for years. Praising its ease of use and that it vastly improves the efficiency of the development pipeline. Herein lies what I think is the problem. The team is so locked into doing things a certain way that development has become routine. Convenience has supplanted artistic or creative drive. I think the games being made by the team have suffered because of it. It’s not just the technical limitations but the creative ones introduced by the restrictions of the engine that have brought Fallout 76 so low. It has become the millstone dragging down the entire team. I feel that if not burdened with this creaking technology we might see a return of the quality we expect from this obviously talented group of developers. And they are talented, this is a game made by the folk who made Skyrim. One of the most beloved video games of all time. But then again maybe that too is part of the problem. Skyrim is beloved, it is also broken in so many ways. Not only is it broken but it’s been re-released multiple times and it’s never really been fixed, and remains a massive seller for the company. For that reason we all need to take some of the blame for the state Fallout 76 is in. We never held Bethesda accountable for the shoddy work in Skyrim, Fallout 3, or even Oblivion way back in the day. We never showed them any evidence that we cared enough about all the minor and major short-comings in any of their titles. We laughed at the bugs and shrugged them off as being part of the “Bethesda experience”. Why then would they see the state that Fallout 76 is in as a problem? The reviews historically have been exceptional, and the sales numbers have been undeniably massive. I too am guilty of this. I own multiple copies of Skyrim and in my Fallout 4 review glossed over all of the technical issues and missing PC features. Never has it been more obvious to me that we as consumers have failed to use the only levers we have when it comes to giving feedback to Bethesda. Not one issue in Fallout 76 aside from the server related problems are unique to Fallout 76. Every one has been seen before in at least on earlier title. Every one has been discussed on various forums, and many have been fixed via mods. Some of those mods have even been ported from game to game to address legacy issues going back as far as Oblivion. 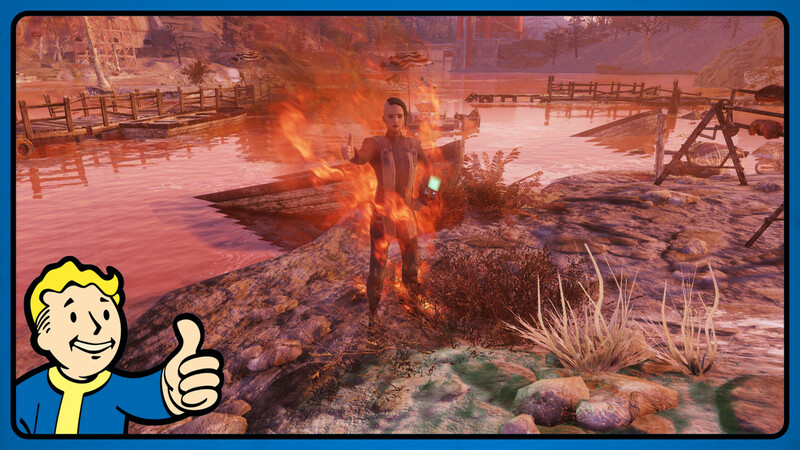 Fallout 76 is a failure on almost every level aside from the exceptional ambient soundtrack from the always brilliant Inon Zur and a few really cool new monsters. I am not sure the series can recover from 76, not only because of what it is as a game, but what it represents for Bethesda as a developer. Todd Howard has already confirmed that that the next two games from the studio will be using the same engine and it is likely far too late to change now. What does that mean for future releases? Who knows. All I can say is I think this might be the end of the road for one of the most beloved franchises in gaming, I just wish it could have been on a high note and not on one so sour. Fallout has been a constant and welcome fixture for the entirety of my adult life. I have walked the scarred landscapes of the wasteland many times and borne witness to the in-game devastation wrought by avarice, pride, and disregard. So perhaps Fallout 76 in that regard is a fitting final chapter to the franchise. Rather than a rich and immersive adventure into the irradiated wastes culminating with a crescendo of consequences for the choices I have made, I instead dully plod along in perpetually repeated mundanity until eventually I just surrender myself to its banality in a near-silent sigh of resignation. Ups The ambient soundtrack is exceptional. Some very creepy and well-designed new monsters. Downs Ugly, buggy, broken, and dated. Quests are boring and repetitive. Crafting and building are a chore. Survival aspects are shallow and irritating. Events even more so. PvP is fundamentally flawed and co-op actively detracts from the limited story elements in the game. The Creation Engine is the anchor weighing down this franchise and the talent behind it. Distinctly un-Fallout in terms of tone. Lacks satirical bite or trademark humour. The PC experience is the worst I have encountered to date on any Bethesda title. No consideration for mouse and keyboard, PC specific displays, or PC hardware capabilities. Which has been the case since Oblivion released in 2006 and therefore unforgivable.